These professional condenser microphones for studio recording and live applications have all the big-time features packed in an extremely compact form factor. They are sold as a matched pair -- perfect for stereophonic recording -- for a price you wouldn't even consider it bought you a single one. 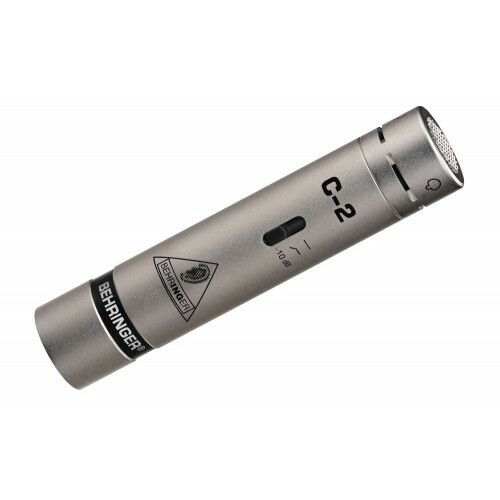 The C-2s utilize a low-mass diaphragm for ultra-wide frequency response and ultimate sound reproduction and their inconspicuous size makes them perfect for acoustic instruments, overhead applications, pianos and similar. The cardioid pickup pattern effectively eliminates feedback, plus there is switchable low frequency roll-off and -10 dB input attenuation. Ultra low-noise transformerless FET input eliminates low-frequency distortion, while a gold-plated 3-pin XLR connector assures the highest signal integrity. Custom microphone stand adapters, windscreens, stereo-bar and transport case are all included, making these condenser microphones ready for action straight out of the box! If super-compact size is paramount but you don't want to compromise on the performance, then a pair of C-2s is the answer. - Perfect for acoustic instruments, overhead, piano, etc.